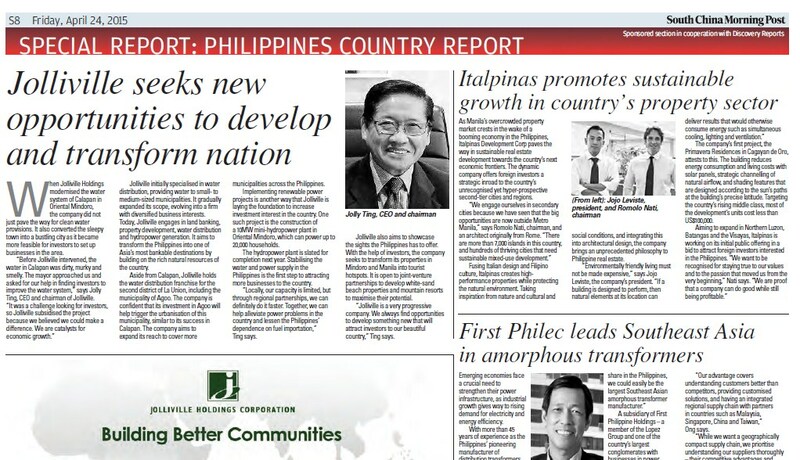 In the spotlight of today’s issue of South China Morning Post (SCMP) is a feature story on Italpinas Euroasian Design and Eco-Development Corporation (ITPI) and the company’s passion for sustainable developments in second-tier cities and regions in the Philippines. Discovery Reports, together with SCMP, reports on ITPI’s efforts in offering investors a strategic inroad to the unrecognized yet hyper-prospective secondary places in the Philippines. ITPI is an Italian-Filipino company that designs and develops sustainable property developments nationwide and Primavera Residences, its flagship development in Cagayan de Oro, recently won in the 2014 Asia Pacific Property Awards in Kuala Lumpur, Malaysia. Fusing Italian design and Filipino culture, ITPI creates high performance properties while protecting the natural environment. Taking inspiration from nature and cultural and social conditions, and integrating this into architectural design, the company brings an unprecedented philosophy to Philippine real estate. “Environmentally friendly living must not be made expensive,” says Jojo Leviste, ITPI’s president. “If a building is designed to perform, then natural elements at its location can deliver results that would otherwise consume energy such as simultaneous cooling, lighting and ventilation.” The company’s first project, the Primavera Residences in Cagayan de Oro, attests to this. Primavera Residences reduces energy consumption and living costs with solar panels, strategic channeling of natural airflow, and shading features that are designed according to the sun’s paths at the building’s precise latitude. Targeting the country’s rising middle class, most of the development’s units cost less than US$100,000. ITPI is aiming to expand in Northern Luzon, Batangas, and the Visayas. The company is also working on its initial public offering (IPO) in a bid to attract foreign investor interested in the Philippines. “We want to be recognized for staying true to our values and to the passion the moved us from the very beginning,” Nati says. “We are proof that a company can do good while still being profitable,” he continued. Do you want to know more about the multi-awarded development, Primavera Residences? You can call 088-880-5002 and 0917 794 2221 or visit our website here.